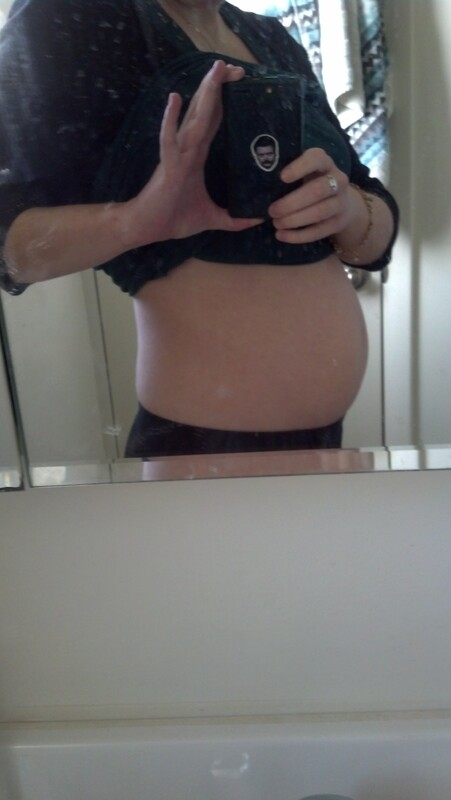 So I’m starting to calm down and get used to being pregnant….mostly. I’m still super paranoid about my stomach – especially now that it’s getting bigger, but isn’t firm yet, I panic a little anytime anything brushes against it. I guess since I’m such an anxious person, I should have expected that I would be the same way with my pregnancy. I’m finally LOOKING pregnant, though, which is a plus – I’ve got this tiny little baby bump and I’m definitely wearing fitted shirts to show it off! I spend a lot of time looking at bump progressions online, and I’ve gotta say, I can’t imagine only having one baby at this point – it looks like it takes these women FOREVER to pop! I’d be questioning my doctor, like, “are you sure? I don’t look pregnant!” So I’m glad I’m getting big early – we’ll see if that stays the same as I get REALLY big! How far along? 15 weeks!! I’m finally on the same calendar as my doctors, haha! So I’m in my fourth month, which means SECOND TRIMESTER!! Woot Woot!! Total weight gain: I’ve stopped weighing myself when I’m home – it’s just making me anxious. The doctor said I’m doing fine, and the babies are growing and doing fine, and I’m too anxious and stressed as it is, so I’ve decided to just take that off my radar and trust the doctors. Maternity clothes? Yes!! Maternity leggings & jeans almost all the time (except when they’re in the wash and I’m wearing regular leggings) and I mix up my tops – but I always wear fitted tops so my little bump is shown off! Stretch marks? I haven’t found any yet, but oh my god my skin is so dry and flaky and itchy. It doesn’t even matter how much lotion I use, within an hour I’m itching like crazy and flaky dry. It’s terrible. Sleep: I fall asleep fairly easily, once I get into a comfortable position, but I wake up 3-4 times a night. Either BB or Tucker is getting up in my space or laying on the covers so I can’t get comfy. BB has taken to occasionally sleeping on the couch, but then I get sad because I’m all alone. Best moment last week: I got to see a lot of my friends this weekend, which was nice – they got to see my bump and I got to get out of the house and be social. Most of the time I’m either working or hanging by myself at home being lazy, so being social was a nice change of pace. Miss anything? Wine. Painkillers – not like I’m on them for fun, but I miss my migraine medication and anything stronger than Tylenol for when I have a regular headache (aka every morning). Movement: Not yet – I feel like I’m SUPER close to feeling them though. I feel like I can ALMOST feel them in my belly, but when I stop and really focus it’s just like my pulse or it stops entirely. I can’t wait till I’m sure – should be soon! Anything making you queasy or sick: Not really – the smell of eggs and seafood is pretty gross, but I’ve always hated those smells so they don’t really count. Gender: We should find out either this week or next!! Symptoms: Ugh what isn’t a symptom? I’ve still got morning sickness, and headaches all day erry day, and I get super hungry out of NOWHERE (seriously, I just had breakfast like 2 hours ago and I’m about to get picked up for family dinner and I had to have an instant breakfast to hold me over), and I’ve got floaters in my eyes ALL THE TIME and I occasionally get light headed. Jeez, babies, take a chill pill. Happy or moody most of the time: I go back and forth. Like, I’m super excited and everything, but I’m also super anxious and worried and stressed, so it comes out as irritability sometimes. Looking forward to: This week I’m super excited to find out if the babies are boys or girls or one of each! It’s exciting stuff and I just hope the babies cooperate so we can find out ASAP!